I am in shock seeing this news. I did visit Notre Dame in early '03. Sadly never went inside due to the massive crowds and being short on time and cash. I truly regret that now. An 800 year old building. Lifetime upon lifetime of artist and architectural and spiritual heritage. Feels awful, and ominous for France. I really hope I'm wrong on the latter. alexanderplatz, Average Joe, 84superchamp and 6 others like this. I was there around 30 years ago during a high school French class trip. I'm not a religious person, but my grandmother was and I bought her a lovely wooden rosary while there. She loved the rosary and wore it out, the string connecting the beads eventually breaking from use. 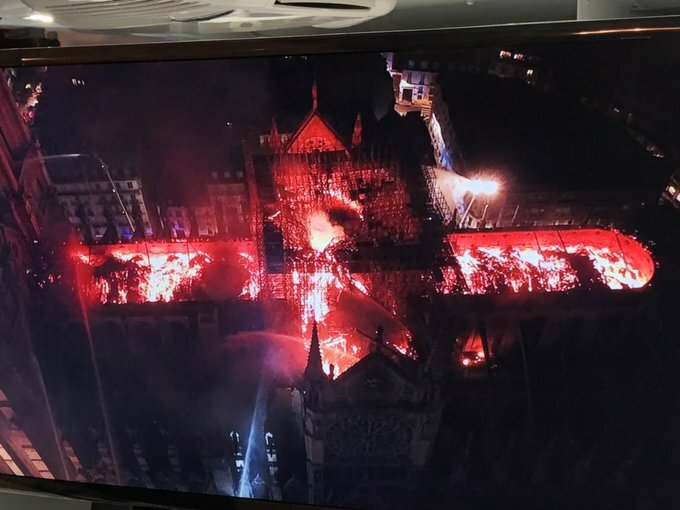 My thoughts of Notre Dame are closely associated to those of my long-passed grandmother and so, apart from the cultural and historical significance, this news saddens me greatly. 84superchamp, Sidney Vicious, fishleehooker and 4 others like this. Looks like the roof construction burnt out, but the vaulted ceiling mostly held. First pic is from Reuters via Twitter. fjblair, D. Stewart, alexanderplatz and 4 others like this. Even when the fire dept showed up, they were only putting water on it.. Why not fire suppression foam? Scaffolding on the roof, some stupid welder probably set it on fire. David Simpson and fishleehooker like this. 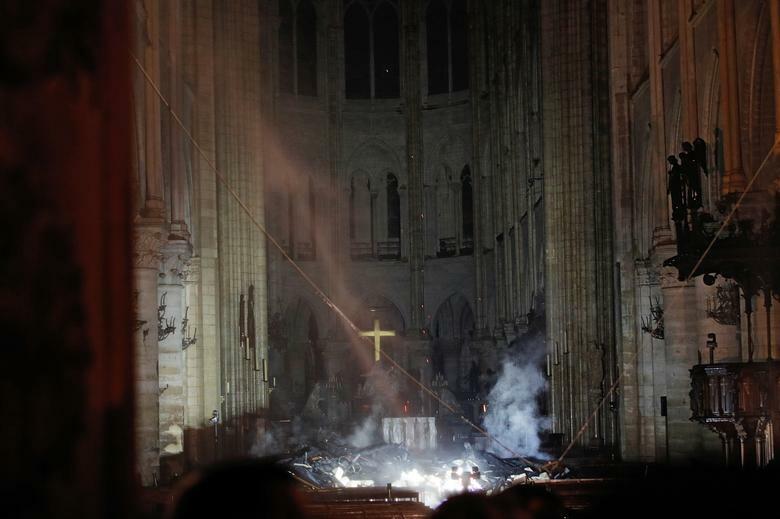 Very sad to see what happened but they'll rebuild it and it will return to its former glory and possibly even better. What are you thinking, since you’ve surveyed the structure and wrote up a report? Peteyvee, Tom CT and MCSS1970 like this. I was there last Sept. There was a lot of talk on the tour about how it was in shambles and Hugo wrote his book to raise awareness. Much of that building's interior is from the 1830's. One funny thing they said on the tour when I mentioned that a lot of it was much newer than what I had thought. The guide said "Yes, we're not the Italians. We're not afraid to knock something down and build something better." Then later she said "When a light bulb burns out in Italy they open a museum around it because they don't want to change it". The building can be rebuilt, and perhaps in time gain its own historicity -- but the history lost cannot be rebuilt. It will be rebuilt and restored! alexanderplatz and shane8 like this. I was lucky enough to be in Notre Dame in 1992. I was amazed at how beautiful it is and how much history was sitting right in front of me. Average Joe and phoenix 7 like this. Fodder for conspiracy theories galore! LMAO! My insensitive self wants to make jokes, but I shall refrain... These days, I get in trouble even when I make them about myself! France owns it... The Catholics maintain it.. I'm not sure that France can afford to rebuild the thing, but I know that Vatican can... and will.. The report on the structural soundness of the stone after high temps may result in more elements needing replacement. Stone becomes friable when heated and loses integrity. Thumpalumpacus, Okra, phoenix 7 and 1 other person like this. I'm hearing on the news now that virtually 'all' of the artwork and what not was saved..
Thumpalumpacus, 84superchamp and Dirty_Tones like this.